Children of all ages will enjoy learning Bible stories and scripture verses with these easy-to-make crafts! From refrigerator magnets to musical instruments, each craft is paired with an important biblical lesson that can be applied to kids' lives today. Bible stories include Creation, Noah, Daniel, Moses, and scenes from the life of Jesus. 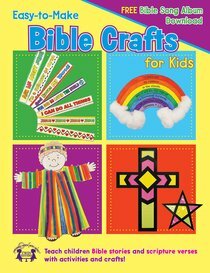 About "Easy to Make Bible Crafts For Kids Activity Book"